Surfing, just like other sports, is learned and perfected though a process of trial and error. A surfer catches thousands of waves and fine-tunes their performances according to their innate natural ability and motivation to master the skills of the sport. Obviously, some are more suited to exceling and with that comes the potential to earn a living through their advanced performances. From my perspective as a coach of talented surfers over the past 30 years, it is interesting to observe the different paths parents of these talented surfers take as their child develops. 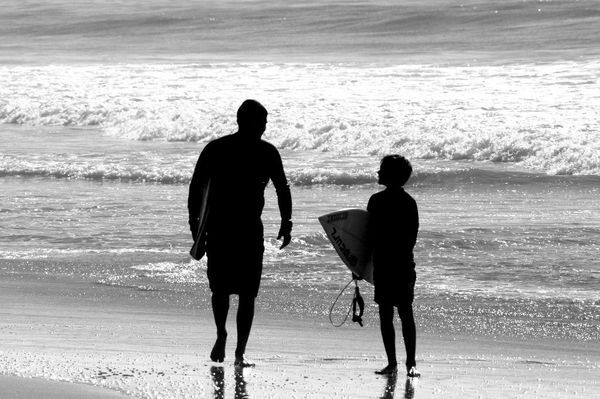 Some, just let them surf, some provide support and guidance and find people like myself to mentor their child. Others are highly motivated and at times aggressive to create opportunities and exposure for their child. Its funny, all of these approaches can work depending on the child, but some end in disaster as some children crash and burn because of the pressure and expectations placed on their young shoulders. I don’t see the parents who get it wrong with the development of their child as intentional, rather its more about them really wanting to help their child, but they just don’t understand the process that works best. After all, we are talking here about a parent’s most precious possession, their own flesh and blood – why would they intentionally put barriers in the path of their child’s development? The accepted science of developing talent is that to become fully developed in a skill, be it a surfer, a golfer, or a violinist for that matter – 10,000hrs of “deep” practice needs to be completed. With the surfer, I am not talking about just surfing, but surfing with a strong focus and intent on becoming the best they can become. That is, working on particular moves, their positioning in the lineup, what waves they catch, etc. It’s the focused attention on the task rather than the total number of hours put in, that is the real difference with a performance at the end of the day. I was in California recently and saw a lot of children, many under 10 years of age, that don’t go to school and surf all day. It was told to me that they do “home school” so that they can develop their surfing more, with the long term aim of making it as a surfer. Understanding how talent develops, I can’t see how most of these surfers could possibly make it. With all day to surf, they would be making decisions when to surf and for how long, BUT, the quality of the sessions and focus on task would be questionable. Many will turn into what former world champion, Peter Townsend calls “parking lot” surfers. Because these surfers have all day to surf, they go to the beach in the morning, check it out and say – “It will be better later”. They come back later and say – “The tides too low”. They come back still later and say – “its gone onshore, I’m not surfing that crap”. So, often, even though they are at the beach they either don’t surf or surf with little enthusiasm. They hang in the parking lot effectively minimizing their progression as their enthusiasm leaks away. Compare this to the child who has a quick surf before going to school, or the hour before dark after school. Now there’s focus. If the child is motivated he or she puts 100% into their surfing to maximize the limited time available. Those that stay at school I reckon will do better than the “home schoolers” in the majority of cases, because of their heightened enthusiasm to surf any and all surf conditions. A good friend of mine, leading Australian Sport Psychologist Dr. Michael Martin asks the question, “what’s the difference between all the musicians who enter the Conservatorium of Music and the ones who leave at the end of their courses as a virtuoso?” They are all good musicians to get a place in the conservatorium, but some stand out in the end. The difference in his words, the virtuosi simply work the hardest. And from my experience, that is the same attribute necessary for surfers who have talent that go on to a professional career. What surfers do on a daily basis is what separates them from the pack. WCT surfers who I have trained all surfed the waves they caught as if they were in a competitive heat. Every day, every surf, every wave. They are out there selecting the best waves, riding them with flair, and finishing with a high level of success. They were naturally focused on doing a good job everyday. Focused surfing. “Deep” practice. That’s how one makes the grade.